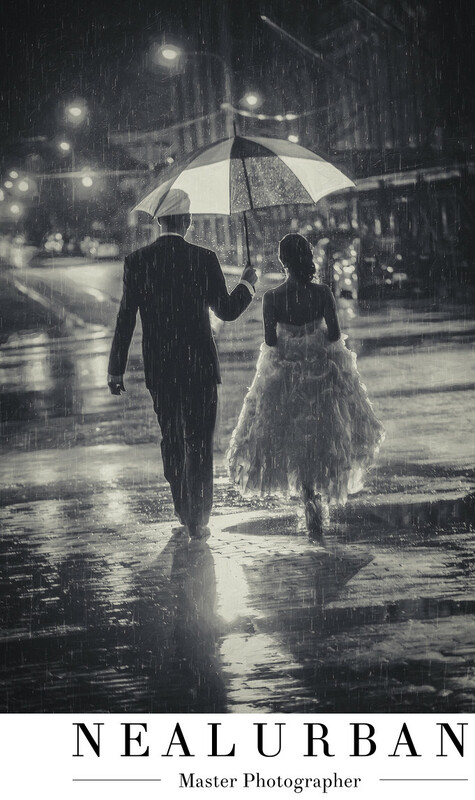 Rainy weddings can be so beautiful! For Kelly and Tom, it started to rain at the end of the night. They had their wedding at the Statler in downtown Buffalo. Niagara Square and City Hall are right across the street from the Statler. The bride and groom mentioned they wanted to go to the Square at some point at night. Neal took a walk over during the reception to check out the area. It had already rained and the ground was wet. He already had the shot in mind based on a painting by Jack Vettriano called the Singing Butler. Tom was very close to his brothers, so we wanted to incorporate them for a shot. Neal got that shot and it was amazing, then it started pouring. The image you see here, is just the bride and groom walking back to the venue. We loved the way Tom was holding the umbrella over himself and lovely wife. Kelly is naturally holding up her wedding dress, so it doesn't fall into the puddles. They are being lit up from the street lights. We really liked how the light was reflecting off of the wet street. There was no planning for this image. We were packing up all the gear we brought to the Square for the photos, and Neal happened to look up and see this. We always have to be paying attention to the bride and groom. This can happen at any time! Location: 107 Delaware Ave Buffalo NY 14202 United States.